A new hard hitting advertising campaign highlighting the fact that ‘we’re not messing’ when it comes to cracking down on environmental crime, gets underway across the borough this week. 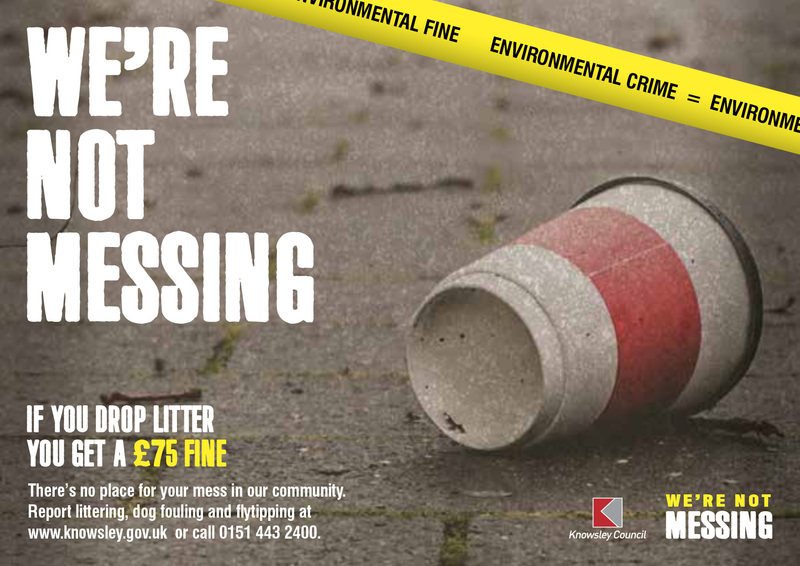 The new campaign, which will be featured on billboards, taxis and phone kiosks, will remind residents of the fines and penalties facing anyone who drops litter, fails to clean up after their dog or is caught fly tipping in Knowsley. Fixed penalty notices of £75 are issued to those dropping litter and £100 for not cleaning up dog mess, while fly-tipping is a criminal offence punishable with an unlimited fine and possible prison sentence. The campaign follows a major clean up blitz earlier this year when ‘weeks of action’ were held to clean up areas of the borough with the highest levels of reported environmental issues, including fly tipping, littering and dog fouling. Cllr Shelley Powell, Knowsley’s Cabinet Member for Communities and Neighbourhoods said: “This campaign will remind residents that we have a zero tolerance approach when it comes to people who fly tip, drop litter or fail clean up their dog’s mess. “These environmental crimes are a blight on our neighbourhoods and that’s why we have enforcement officers on patrol across Knowsley who have the power to issue Fixed Penalty Notices to irresponsible owners who don’t clean up after their dog, as well as those who drop litter.